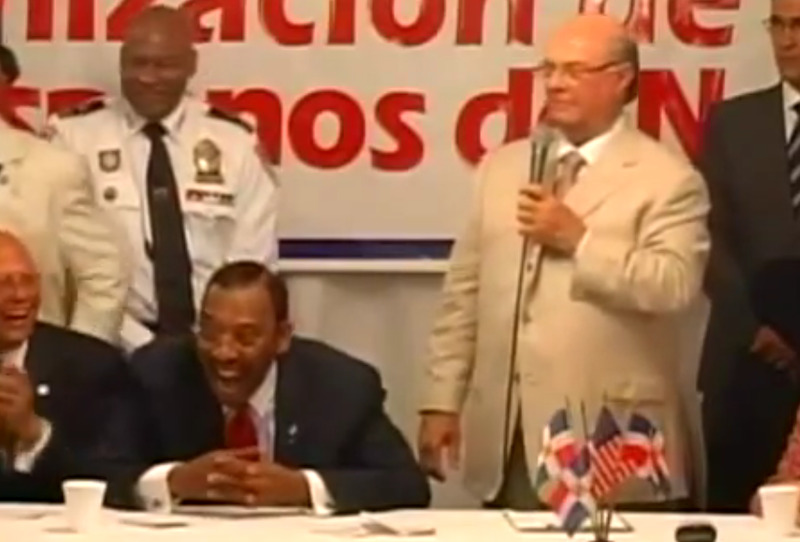 PHOTO (Screen Capture): NYS Democratic Senator Ruben Diaz, Sr. reacting to former Dominican Republic president Hipólito Mejia's "birther" comments about U.S. President Barack Obama at a New York Hispanic Clergy Organization gathering on April 4th, 2012. On May 20th citizens of the Dominican Republic will be going to the voting booths to elect their next president and hence, in early April, the two leading contenders made their way to New York to make their pitch to the city's sizable Dominican population. Former Dominican president Hipólito Mejia, who is vying for a second chance on the presidential chair, was the only candidate to accept an invite by homophobic Democratic State Senator Ruben Diaz, Sr. to attend a gathering of his New York Hispanic Clergy Organization in the Bronx on April 4th. The love fest got to an inauspicious start when Senator Diaz introduced Mejia using the name of his main opponent Danilo Medina to nervous laughter from attendees. He was quickly corrected and the meeting went ahead. According to Diario Libre, Mejia said that his campaign was battling "Satanic elements" and argued that while the economic situation of the Caribbean island was dire, the greatest challenge it faced was a "moral crisis". As attendants shouted "Llegó papá"*, Mejia stated that as president he would never allow gays to marry or weaken the island's strict anti-abortion laws. This led, according to Primicias, to an endorsement by Diaz who championed Mejia's commitment to oppose marriage equality in the Dominican Republic and throughout the world (never mind that the Dominican constitution already bans recognition of marriages other than those between a man and a woman). "We cannot walk around with warm diapers since Hipólito is the only one who has respected and maintained a well-defined and clear Christian mission and a platform that guarantees respect of Biblical and moral values that are part of our doctrine," said Diaz. The event received little if any attention from local English-language media but was front-page news in the Dominican Republic. Since then, though, several videos of the event have surfaced on YouTube and one of them in particular has drawn intense criticism. If Obama who came from Africa and grew up over there can become the President, why can't any of you reach as high considering you have a more amusing [ethnic] mix than Obama's? Mejia's embrace of the so-called "birther" fallacy of those who refuse to acknowledge or believe that Barack Obama was born in the United States drew immediate condemnation in the island all across the political landscape. And what, pray tell, does Mejia mean by referring to others in the room as having a "more amusing [ethnic] mix than Obama's"? Once the videos surfaced, the reaction was swift. On April 12th, 31 of the 32 members of the Dominican Republic Senate signed an official apology to the President of the United States and called Mejia's statements about Obama "unfortunate" and "offensive". The only Dominican Senator who voted against the measure was a member of the Christian Social Reform Party. According to reports, some of the other NYC political leaders at the event were NYS Senator Adriano Espaillat, NYC Councilmembers Ydanis Rodriguez and Fernando Rodriguez and NYS Assemblymembers Guillermo Linares, Nelson Castro and Marcos Crespo. A couple of those who were said to attend the meeting are long-time Diaz allies but it is disappointing to see others Latino politicians who are progressive on LGBT isues at the event. So far I am not aware of a single statement from them denouncing the homophobic tenor of the even nor Mejia's "birtherism". As for Diaz, apparently he has admitted Mejia might have put his foot in his mouth but alleges that the comments were taken out of context. Looking at an excerpt of the video, though, you'll find it hard to see any indication that Diaz thought there was anything wrong with Mejia's statement. * Yes, "Llegó papá" as in "Daddy's arrived!" which is the campaign's theme as well as Mejia's Twitter profile name. There’s simply no place in politics for this kind of a remark. Senator Espaillat strongly objects to such language. As an Obama delegate in the upcoming Democratic Convention, Senator Espaillat looks forward to campaigning for President Obama and helping him get reelected. ---> April 19th: The Dominican Republic's National Progressive Force party has released an attack ad against Mejia accusing him of shaming the nation on foreign soil and slamming him for being "racist, uneducated and irresponsible". The ad is currently running on all the national commercial television networks. Regarding his outlandish comments about President Obama, this is coming from a man whose citizens have coined their own term for mixed-race peoples who continue to deny their African heritage. It is not funny that he finds it amusing that there are still peoples of African decent in his country who will look you in the eye and deny their African heritage. FYI The "birther" issue is not so much where Obama was born but the fact he father was not a US citizen. The "birther" movement was started by the Liberal Left, by Hillary supporters who looked for a way to get O. off the Dem ballot.A female Annapolis grad wrote one of the first, soon-to-go-viral e-mails on this.